The new 430s may have had the advantage in qualifying and in race 1, but Paolo Ruberti led the Sunday morning race throughout his half hour stint, in the Edil Cris Ferrari 360, and a longer stop (thanks to Saturday’s success) for the Playteam Ferrari 430 dropped that away from the lead, Alessandro Per Guidi recovering to a strong second place, but a quarter of a minute behind Ruberti’s partner, Matteo Cressoni. Thanks to the support of the WTCC, there was a 50,000 crowd at Magny-Cours – and the opening period of the race was very entertaining. Ruberti led Bartyan from the lights, and these two eased away from the field – and the gap between them settled at about two seconds. Johnny Mowlem, in the Autorlando Porsche showed that there’s life in the old dog (the GT3-RSR) by easing inside Perez Aicart in the Mosler through the long right hander onto the back straight. The Mosler ran onto the dirt, and dropped to fifth, briefly, behind the fastest of the Vipers, that of Perazzini. Aicart complained of a handling imbalance at the rear – and it looked like it. He had oversteer almost everywhere, but soon passed Perazzini, and closed on Mowlem. V8 power took him into third on the back straight, but Mowlem clung on, and hopefully enjoyed the spectacle of a tail-happy Mosler. Six laps into the 28 and the gap between the 360 and 430 had settled at two seconds or so, with Aicart six back, and Mowlem right behind. Bartyan was the first of the front-runners to pit, after 12 laps, Per Guidi emerging from the long pitstop only just ahead of Ruberti, who promptly lapped the SaraFree Ferrari 430. 14 laps and Ruberti led Aicart and Mowlem by 14 seconds, the Mosler then pitting. Ruberti pitted, to Cressoni after 15, Mowlem leading for a lap before handing over to Gianluca Roda. In effect, the length of the (penalty) pit stops decided it, Cressoni (in the 1:47s) 20 seconds ahead of Roda (in the 1:49s), with Guidi about to take second place (in the 1:45s) – after a stop that was 45 seconds longer than the other two. But there weren’t enough laps left for the blue Ferrari F430 to catch the black 360. The tail happy Mosler was fourth at this stage, but about to passed by the Icer Brakes F430 – the one that Peter Sundberg had qualified on the GT2 pole at Istanbul three weeks ago. Sundberg duly passed Guerrero, but was eight seconds behind Roda at the flag. 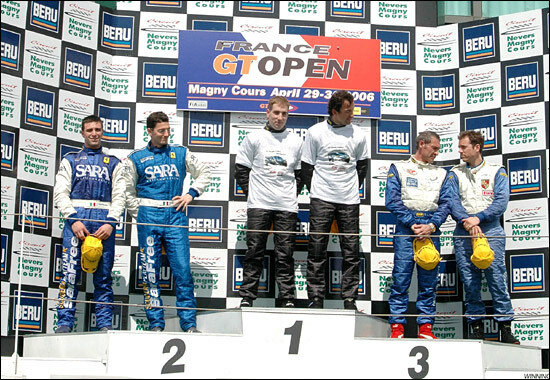 Any slight hope that Per Guidi had of catching Cressoni vanished when he was chopped by one of the SEAT Cupras, the quick spin sealing his fate – and second place. Behind Gueurrero was none other than Andrea Montermini, his partner, Bastos, having spun as the race started. The other Mosler was seventh, ahead of a great scrap for GTS honours, between Cioci in the Viper and Zani, racing one of the BMS Scuderia Italia GT3 Aston Martins. These two finished 1-2 again, just as they had in Saturday’s race, but split by three-tenths this time – rather than the nine-tenths on Saturday. Battle between these two marques, and some of the same drivers, will resume at Silverstone next weekend. Rather than awarding huge pit stop penalties, for previous successes, perhaps the organizers could reconsider – and maybe grant handicaps according to race performance? Say a standard stop of 30 seconds (to change drivers), and a 40 second stop for Guidi and Bartyan, for example? He (Johnny Mowlem) had travelled direct to France from ACEMCO Saleen testing at Homestead, and was "very impressed with the series. There are two 430s, some good 360s, and some very competitive drivers. In terms of drivers, it's as competitive as the Le Mans Series (GT2 Class). We were never going to beat those two Ferraris, and the Mosler should have been significantly quicker than us, but we were the first true pro-gentleman pairing home. I'm looking forward to doing some more of these races - and I can use my Spanish in the press conference."